Last frame from a sequence where the book was tracked using the ciruclant tracker. 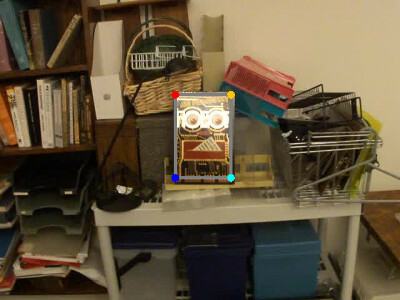 In this example several different trackers can be used to track the object in the video. All of the trackers in this example use texture information (see mean-shift example for color based trackers) to localize and track the object. No one single tracker can track all the video sequences provided with BoofCV or in general. You should try out all the different video sequences and see which trackers work best when. * directly if more control is needed. * This is an active area of research and all of the trackers eventually diverge given a long enough sequence. // Create the tracker. Comment/Uncomment to change the tracker. This page was last edited on 20 January 2018, at 00:05.